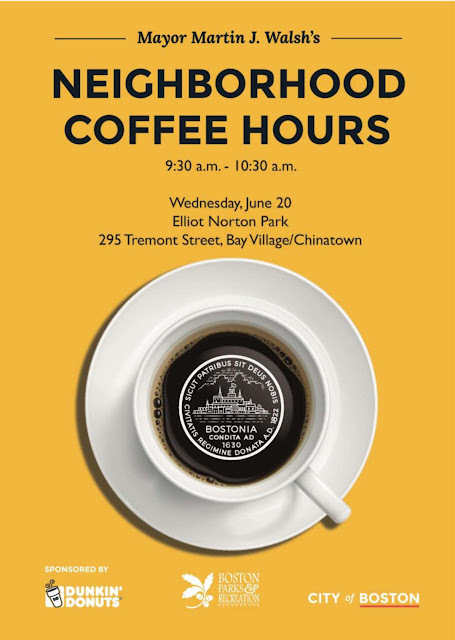 Please kindly share the attached bilingual flyer to your friends, family, and neighbors about Mayor Walsh's Coffee Hour in Eliot Norton Park next Wednesday from 9:30 - 10:30 AM. We'll have free coffee, tea, breakfast treats, and fresh fruit. Lion Dance will be performed by students from Josiah Quincy Elementary School. Each family will receive a flowering plant grown in the City's greenhouses as a gift from Mayor Walsh. Also, there will be a raffle with prizes from Dunkin' Donuts. This event is family friendly and is open to the public. No registration required.